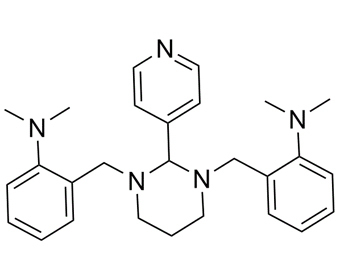 GANT61 is a small-molecule inhibitor of glioma-associated oncogene 1 (GLI1)- and GLI2-mediated transcription at the nuclear level that exerts its effect by preventing DNA binding. It has been demonstrated to induce cell death against Ewing's sarcoma family tumor (ESFT) cell lines in a dose-dependent manner.
. Fu J, et al. GANT-61 inhibits pancreatic cancer stem cell growth in vitro and in NOD/SCID/IL2R gamma null mice xenograft. Cancer Lett. 2013 Mar 1;330(1):22-32.
. Wickstrom M, et al. Targeting the hedgehog signal transduction pathway at the level of GLI inhibits neuroblastoma cell growth in vitro and in vivo. Int J Cancer. 2013 Apr 1;132(7):1516-24.